Since late spring, the macro-investing crowd has been absorbed with the question: will they or won’t they? The topic of conjecture being the possibility that the Federal Reserve will soon start to taper its monthly purchases of $85 billion in Treasuries and agency debt. Investors are pining not over the thought that the Fed will cut them off completely, or that it will sell its massive fixed income portfolio; just over the fact that the punch bowl upon which the market has become so dependent will be dialed back just a touch. That is a pretty strong indictment of how fragile the U.S. economy is four years into this so-called recovery. Growth remains sluggish, with Q2’s GDP advance of 2.5% barely making up for the prior two quarters’ 0.1% and 1.1% reading. The employment situation is bleak, unless one aspires to put his college degree to use as a part-time hospitality worker without benefits. If there is any bright spot it is that inflation….the second component of the Fed’s dual mandate…remains tame. But even that is not necessarily good news. After all, a key objective of the Fed’s myriad extraordinary measures is to reflate the economy, a by-product of which is increased upward pricing pressure. As evidenced in the chart below, efforts to cause a noticeable uptick in inflation have proven less than successful. 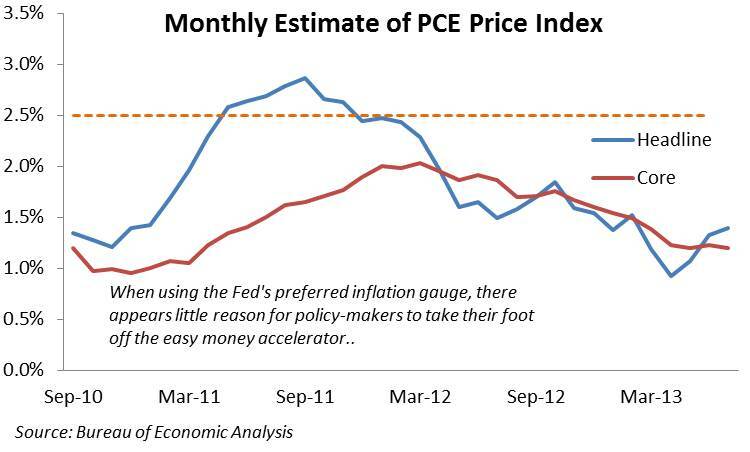 So why would the Fed want to see inflation, an economic concept that most people consider a bad thing, rise? The answer can be found two unique characteristics of the U.S. economy: the massive use of leverage by firms and consumers, and the oversized role played by the service sector. With regard to the former, in the aftermath of the credit bubble, company revenues took a hit and millions lost their jobs. The rub was that their gargantuan fixed-income obligations did not change…such is the nature of fixed-income….causing an alarming rise in delinquencies. The consequent unwinding of debt, accompanied by lower spending (and thus prices) in theory could lead to a deleveraging/deflationary spiral which would spell doom in an advanced economy, benefiting only bankruptcy attorneys and a few savvy vulture funds. With an eye towards that dire scenario, the Fed opened up the floodgates to minimize the deflation risk. The second reason policy makers tolerate a reasonable level of inflation, is due to what it signifies with regard to economic growth. In a service based economy, a primary source of inflation is wages. When growth prospects are promising, corporate management ramps up activity, including hiring. The accompanying demand for increased labor allows workers to command a higher wage. By the same token, those increased earnings enable workers to be looser with their purse strings, thus giving the green light to other producers to raise prices without fear of driving away business. This dynamic has been woefully absent during the current recovery. 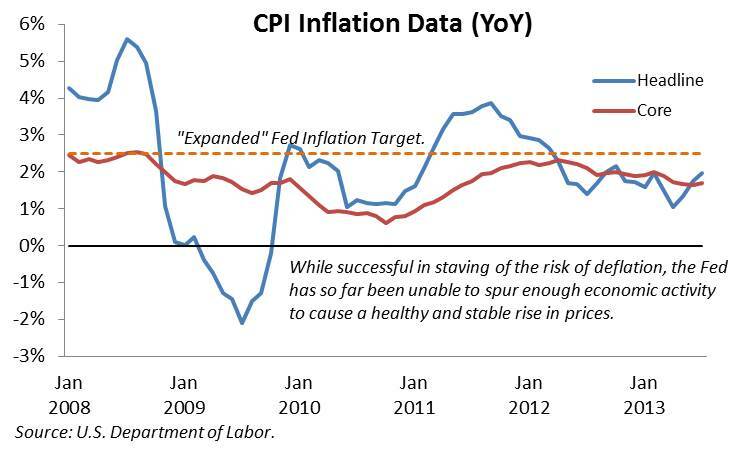 As seen in the top chart, inflation as measured by CPI is well below the look the other way acceptable level of 2.5%. While year-on-year inflation for July registered 2%, core inflation ticked in at just 1.7%. And yes, core inflation…that is scrubbing out volatile food and energy products….is a better barometer of longer-term pricing pressure in an advanced economy, where a smaller slice of consumption is spent directly on raw materials. Instead, short-term rises in agriculture and energy prices are absorbed by firms that process these goods into final-use consumer products. Of course that puts margins under pressure during periods of rising commodities, especially in soft economies where costs cannot be easily passed along. Sound familiar? While core CPI has stayed in the range of 1.6%-1.7% over the past four months, the Fed’s preferred inflation gauge, the broader Personal Consumption Expenditure Price Index, has been even more subdued, with the core number stuck on 1.2% over the same period. No, a slip into deflationary territory is not likely (there are over three trillion reasons….each with a picture of George Washington on it…why this is the case), but such weak upward pricing pressure illustrates the futility of the Fed’s actions to date. The variance between the two series is due to the different weight the housing sector plays in the data’s composition. 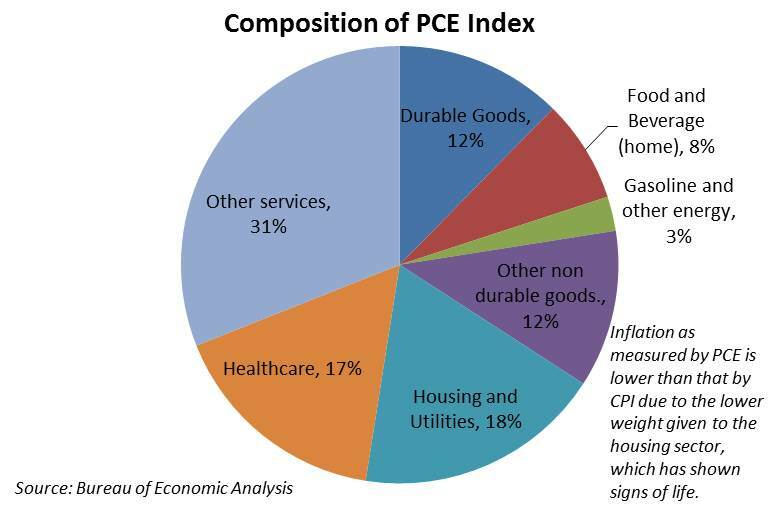 Housing accounts for 31% of CPI and only 18% in the PCE bucket. This disparity, when coupled with housing’s 2.3% YOY rise (as measured by CPI) explains why CPI is more elevated than the PCE figure. When focusing solely on PCE, the housing segment has averaged a 2.1% YOY gain over the past six quarters compared to only a 1.6% average gain in the headline figure (and 1.7% in core). Good news, yes. But after years in the dumps, the sector could only go up. 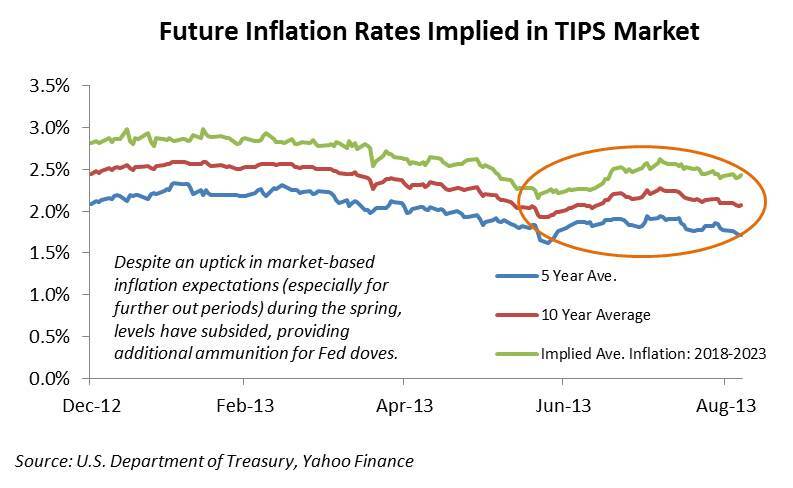 Developments in inflation data are always on the radar screens of financial market participants. Paradoxically, it is not the presence of accelerating inflation…..there is none….that has roiled bond markets since May. It is the fear that the Fed will decrease its purchasing activity, thus removing the marginal buyer that has supported the fixed income market since emerging from the financial crisis. And while inflation, the standard bugaboo of bond investors, is minimal, without the guarantee that the Fed will be there to absorb the ballooning Treasury market, supply will overwhelm diminished demand, thus sending prices….who knows where. And no one wants to be the last one out the door. 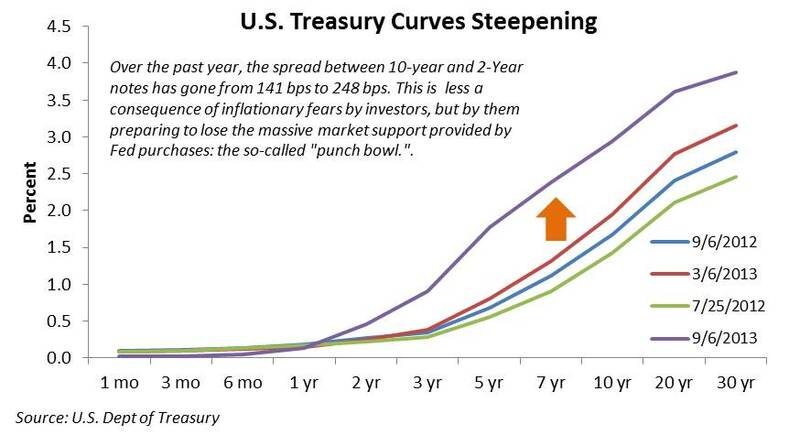 This fear has manifested itself in the recent steepening of the yield curve. Just over a year ago, when the 10-Year Note was plumbing the depths of 1.43%, the difference between the yield on the 10-Year and 2-Year Notes was a flat 121 basis points. As recently as March the delta was still 170 bps. 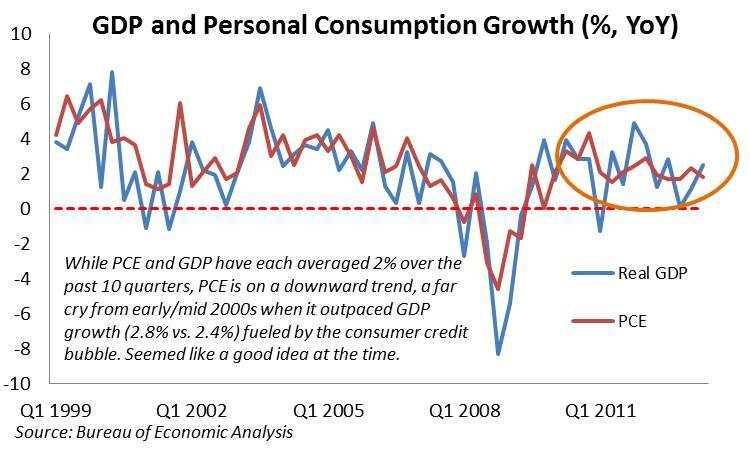 As of last Friday, it had exploded to 248 bps as the 10-Year launched a much delayed assault on 3%. Even the 2-Year, which has spent much of the post-crisis era tethered to the Fed Funds rate of 0.25%, has nearly doubled to 0.46%. While runaway inflation may cause bond investors, policy makers and ordinary consumers headaches, a touch of the stuff can be a favorable development for equity investors. It signals that firms are able to raise prices and potentially increase profitability, or perhaps hire your adult offspring living in the basement playing X-Box. As alluded to earlier, the ability to raise prices…often as a consequence of demand for higher wages in a services-driven economy….is a key component of the virtuous circle the U.S. relies upon considering that personal consumption comprises 70% of the economic pie. 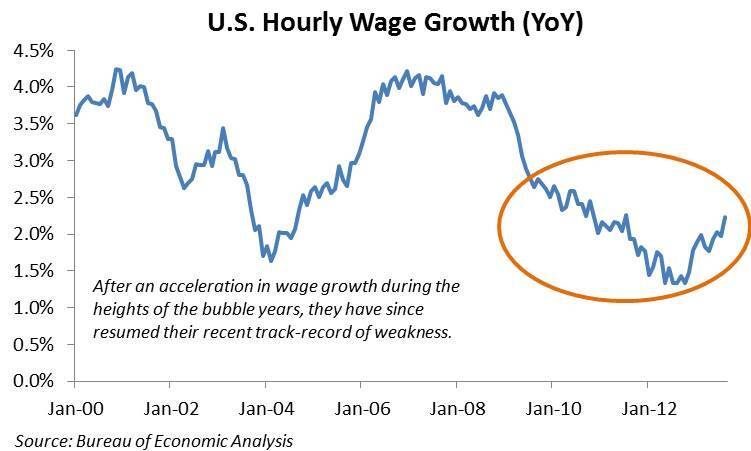 Given the lackluster jobs growth and stagnant wages, this mechanism is nowhere near firing on all cylinders. A question for another day is whether this consumption machine is broken beyond repair. Ironically, it can be argued that one of the few beneficiaries of the Obama Recovery is Wall Street as equity markets, driven by a search for yield (damn the fundamentals), reached new highs this summer. Unfortunately, these newfound riches have not funded major corporate expansion (or hiring), nor has the elusive wealth effect trigged broad-based consumption that would catalyze secondary and tertiary layers of the economy (fine wine, BMWs and real estate in the Hamptons notwithstanding). Call this bonanza what you will…hot money, paper profits… regardless of the term it will likely prove ephemeral once the Fed ceases to be a dominant player in financial markets. All eyes are now on the fast-approaching September FOMC meeting as market participants await any decision to curtail (I’m sick of the word taper, right along with headwinds, green shoots, punch bowl etc.) bond purchases. When digging into the details of the jobs data, it is apparent that recent growth has not only been insufficient to absorb those sidelined during the recession in a timely manner, but also what gains there are have not occurred in the most productive segments of the economy. Given this, the fact that inflationary pressure is minimal and Chairman Bernanke’s preference to err on the side of caution until growth becomes entrenched (if ever) it appears the Fed has every reason imaginable to maintain its current dovish stance.